Nausori Airport in Fiji - Flying into Suva? Where is Nausori airport? Find out about the 'other' international airport in Fiji in this section. A must read if you're flying into Suva. Nausori airport is the domestic hub of Fiji servicing Suva and the islands. 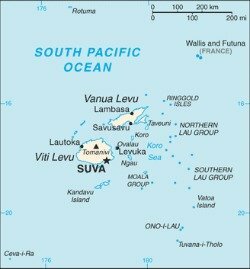 Nausori airport is located on the eastern side of the main island, Viti Levu, while Nadi International Airport is situated on the west coast (visit our Map of Fiji information page for our collection of maps). Nausori is a town not to be confused with Nausori highlands, which is situated on the western side of Viti Levu. Nausori airport is 3km southeast of Nausori and 22km from the capital, Suva. The Kings Road from Suva to Nausori is the busiest section of road throughout Fiji. It takes about 30 minutes and a local bus ticket will cost you about FJ$2. The new four lane Rewa bridge connecting Suva to Nausori over the Rewa river was completed in 2006. Nausori International Airport (IATA: SUV, ICAO: NFNA) is also known as Luvuluvu. 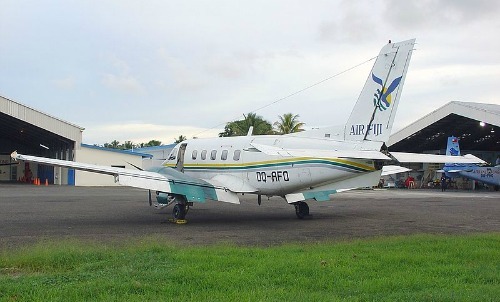 Nausori airport in Fiji is owned by Airports Fiji Limited, a government owned company. Visit our Flights to Fiji section for more information about coming to Fiji. Daily domestic transfers to your connecting international flight in Nadi takes less than 30 minutes. For information regarding airlines in Fiji, visit Fiji Airlines section which has information about Air Pacific, Fiji's international carrier, and Pacific Sun, Fiji's primary domestic carrier.